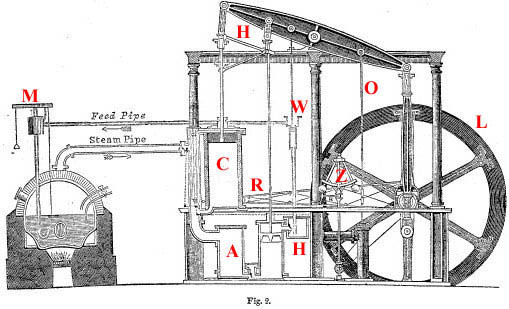 This model of a Beam Engine is based on an engraving reproduced in ”Chambers Information for the People" (a part work encyclopedia published in the early 1840s.) Neither the manufacturer or the engineer that designed the original prototype from which the engraving was made is mentioned in the encyclopedia. 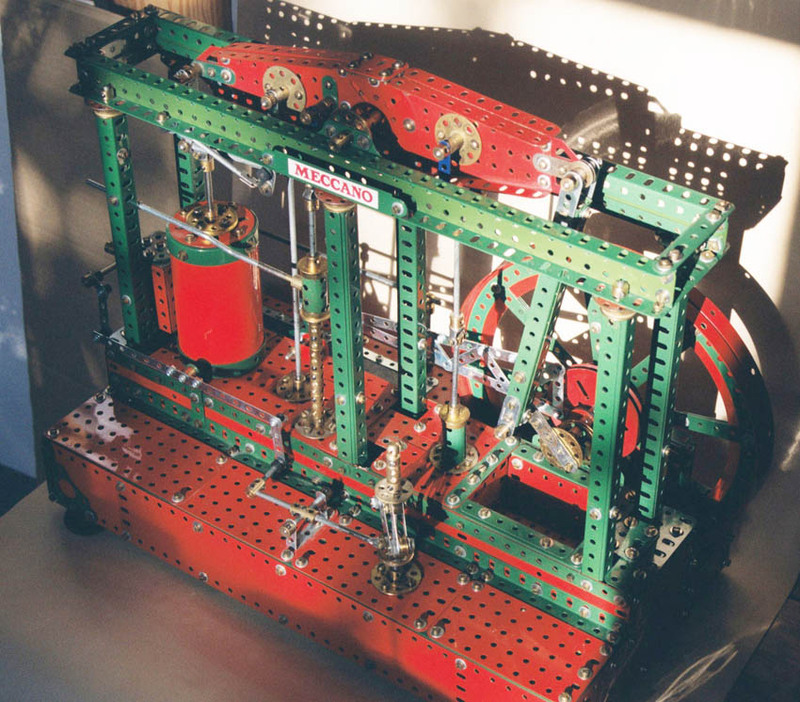 For many years I had wanted to make a Meccano model of this engine and after visiting the Kew Steam Museum in May 1998 I was inspired to build it. The museum has a similar engine but with twin beams and cylinders. The model was completed in 1999 and has been modified several times since then. I scaled the plan up using the diameter of the large flanged ring P/N 167b to form the flywheel as a reference for the proportions and size of the rest of the Meccano model. The only non standard parts used are a 1" pulley with holes drilled to match those in the 1" bush wheel, a large diameter boiler and small ring flanges. The latter two parts were made by the late Ken Gordon of Melbourne Australia. 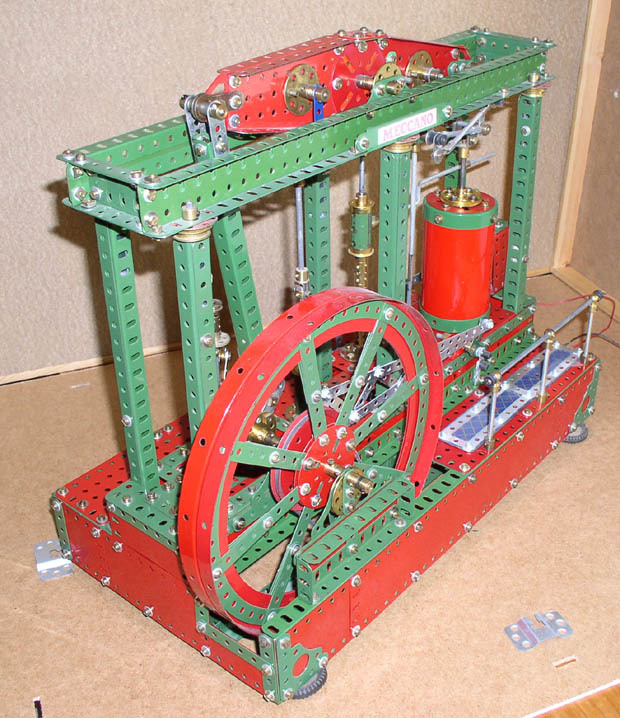 The model is belt driven by an old video recorder motor, these are powerful and silent, excellent for Meccano models although they run at a fairly high speed. One big advantage is they were designed for constant running. I have run the model all day at many exhibitions with no problems, other than switching off the power source off every few hours to cool down. The scan above is from the original engraving that inspired the model. Below are two more views of the model. 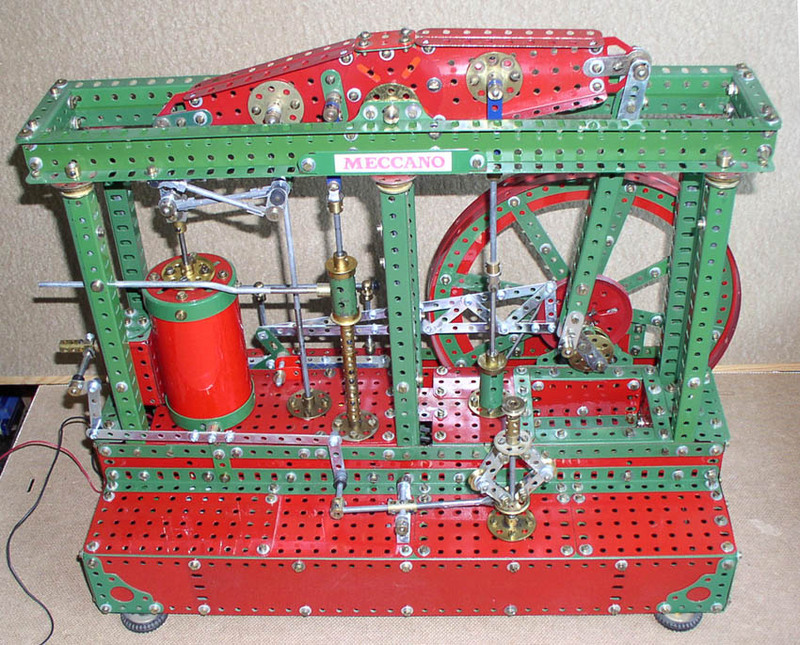 In april 2011 I completed a new version of the above Beam Engine, see below the model can be seen in operation on YouTube click the link below. 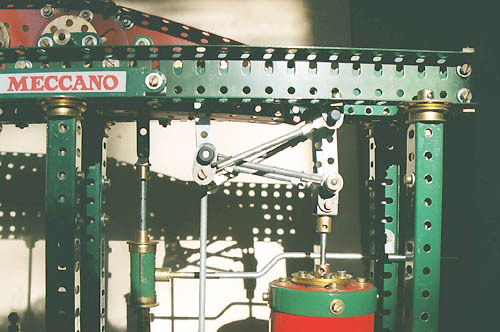 Back to Gallery of Meccano Models.